If you haven’t already started your holiday email marketing, you probably should have. That’s the advice of a new complimentary e-book from MDG Advertising. According to “12 Holiday Email Marketing Secrets You Can Use, Right Now,” 40% of consumers start their holiday shopping before the end of October. Perhaps even more important, 49% of marketers launch holiday campaigns before Halloween. There’s a good chance your biggest competitor may be one of them. This useful e-book goes on to give additional reasons why starting early is good, but also why you need to adjust your start date for specific events like Cyber Monday. You’ll get tips for creating a greater sense of urgency, as well as a few surprising tactics to rev up your response rate. If you’re a marketer who uses email during the holidays, then consider this a must-read. The e-book divides the tips into four useful categories to keep things simple. You’ll learn “When to Start Sending,” “Key Optimization Tactics,” What’s Different in 2015,” and “How to Finish Strong.” Each section is well organized, providing just what you need to know and nothing you don’t. 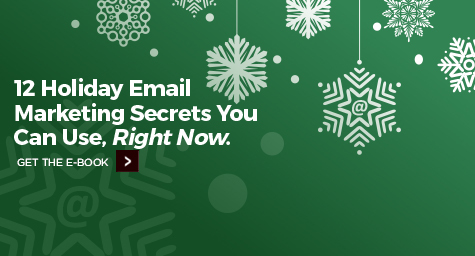 “12 Holiday Email Marketing Secrets You Can Use, Right Now” also offers some reassuring statistics. For example, 71% of online adults say they are influenced by promotional emails to take some sort of action during the holidays. So if you aren’t utilizing this medium to its fullest, you probably should be. How to make sure your emails won’t get lost in the holiday rush. Last year, consumers received billions of emails during the holidays. In fact, the MailChimp platform sent 14.1 billion in December alone. So if you don’t want to get lost in the holiday rush, you’ll need to work hard to stand out. This complimentary new e-book from MDG Advertising can help. Unwrap the latest tactics in holiday email marketing. Contact MDG Advertising today at 561-338-7797.